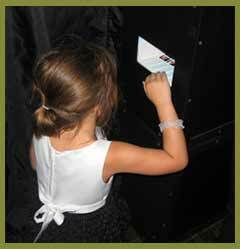 Adding a wedding photo booth rental to your wedding is easy and memorable. Our booths work in all types of venues and settings. San Diego has some of the most beautiful venues for weddings. We have had the opportunity to work with brides all over San Diego. Let us work with you. Let us help customize your package so it works perfectly for You! Yes, we include a photo guestbook in our wedding packages along with a customized photo strip, double instant prints, and a digital copy of the pictures taken. We also set up a personalized online photo gallery. Call us to find out more or to reserve your photo booth – 760.652.9730 or send us a wedding photo booth inquiry. Do you have a schedule for the day? If you have a schedule for the day please share it with us and we will make sure we have the wedding photo booth on “quiet” during your special moments – your first dance, dancing with your father or mother, speeches, etc. We work with you or your wedding planner to make sure your day is special. We have props that are suitable for all ages. We have a fantastic prop selection and we can work with you to customize props for your theme. 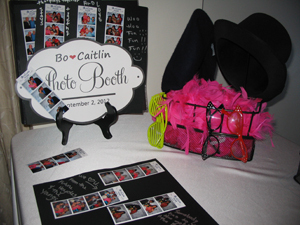 The photo booth is usually the favorite entertainment for the adults and children. That is, after dancing.